Hi all! In a deep-water environment, mass transport complexes (MTCs), products of mass transportation processes, often dominate the basin stratigraphy, and are intercalated with turbidite deposits (Dykstra et al., 2011). MTCs are commonly large enough to be geohazards, and the largest can be tsunami genic (e.g., Watts, 1998, 2003; Wright and Rathje, 2003; Mosher et al., 2010; Yamada et al., 2011). MTCs became of interest to oil and gas exploration and development when wells and facilities were placed in deep-water environments (Shipp et al., 2004; Mosher et al., 2010; Yamada et al., 2011). 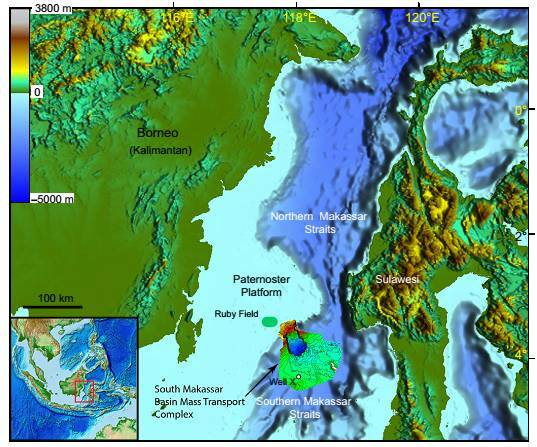 Data from the southern part of the Makassar Strait basin revealed a very extensive mass transport complex (MTC) in the upper part of the basin fill that covers an area of ~8985 km2. Here Armandita et al. (2015) focus on describing the morphology of this giant relatively coherent MTC, and try to explain why it is characterized by large-scale internal deformation rather than disintegrating into smaller, more chaotic blocks. Read the abstract, or check the publisher page to read the full text, or contact the author to get a copy of this paper. Tagged deep water, geohazards, Makassar Strait, mass transport deposit, oil and gas exploration, structural geology.